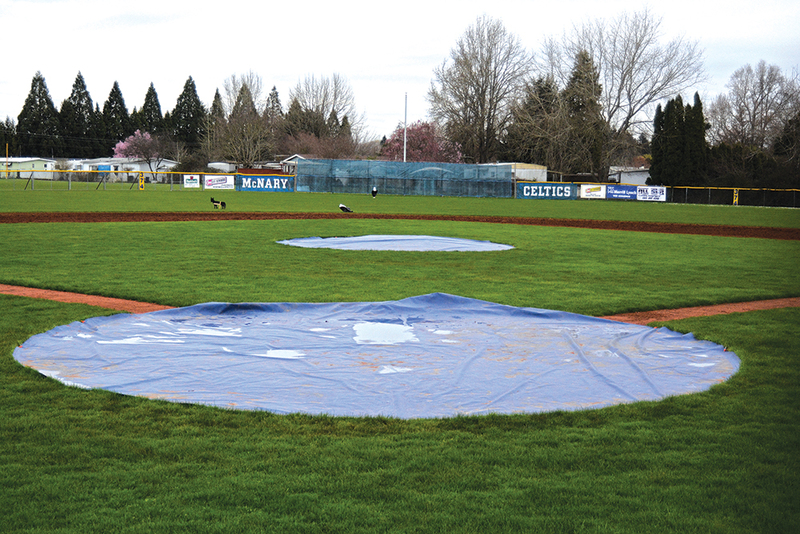 The McNary varsity baseball team hasn’t been able to practice on its field, much less play a game. McNary was scheduled to open its season on March 15 at home against Canby and then host Tualatin on March 22 but both games were cancelled. Thanks to the wettest February on record, the Celtics have mostly been forced to practice in the gym or on the turf field. Making matters worse, McNary put in new dirt on its infield during the offseason that has yet to dry out. The Celtics were able to get in two away games—a 14-0 victory at Barlow on Tuesday, March 21 and a 4-1 loss at Grant on Thursday, March 23. After missing all of last season due to elbow surgery, senior Riley Hays started on the mound against Barlow, recording three strikeouts and allowing one hit but seven walks over four and one-third innings. Jonah Geist got the final five outs to complete the shutout. Keeker wasn’t as pleased with the Celtics offensively. McNary scored 14 runs but only had six hits, taking advantage of 10 walks and three Barlow errors. Tyler Covalt was 2-for-3 with two runs and three RBIs. Tyler Ellertson was 2-for-3 with three runs and two RBIs. Joshua Benson also scored three runs and Brendan Frizelle added two RBIs. McNary’s hitting struggles were more obvious against Grant as the Celtics had just one hit by Jacob Jackson in the loss. “We’re going to have to get better at the plate,” Keeker said. On the mound, Kyle McAllister allowed one hit and one earned run over four and one-third innings as McNary led 1-0 before an error in the bottom of the fifth led to four runs. Playing in the Coach Bob Invitational March 27-31, the Celtics found much better weather in Arizona. McNary lost its first game 12-5 to Millennium. The Celtics fell behind 5-1 but scored two runs in the fourth and two more in the fifth to tie the game 5-5. However, the host Tigers scored seven runs in the sixth. McNary finished with four errors in the loss. Frizelle was 3-for-3 with one run and one RBI. Hays was 2-for-2 with an RBI. The Celtics also lost their second game, 8-2, to Heritage, Colo.
Josiah Gilbert got his first start from the mound of the season but was chased with one out in the fourth inning after allowing three runs on seven hits and three walks. Heritage scored four runs in the fourth and added three more in the fifth. McNary scored both of its runs in the sixth. The Celtics are scheduled to open league play at home on Tuesday, April 4 against North Salem. First pitch is at 5 p.m.